Brighton & Hove Albion defender Dan Burn made his debut for the Seagulls in their fourth round FA Cup tie at home to West Bromwich Albion. All pictures by PW Sporting Photography. 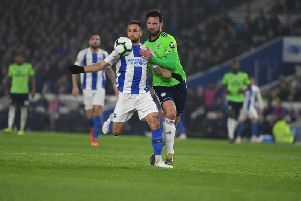 Brighton & Hove Albion were left to rue their profligacy in front of goal after their 0-0 home draw with Championship side West Bromwich Albion in the fourth round of the FA Cup this afternoon. Seagulls boss Chris Hughton made six changes to his starting XI following their 2-1 away defeat to Manchester United last weekend, with Bruno, debutant Dan Burn, Beram Kayal, Yves Bissouma, Florin Andone, and Anthony Knockaert all coming into the starting line-up. Florin Andone strikes at goal. Centre-back Burn joined Albion from Championship side Wigan Athletic last summer, but was loaned out to the Latics until January 1. Baggies manager Darren Moore meanwhile made nine changes to his team that played in West Brom's 2-1 away win over Bolton Wanderers. Welsh forward Hal Robson-Kanu and young midfielder Rekeem Harper were the only players to retain their places from last Monday's victory. The first 15 minutes saw the hosts have the better of the game without creating any clear cut opportunities. Brighton produced the first save out of Baggies' 'keeper Jonathan Bond on 23 minutes. Bissouma, the liveliest Seagulls player on the pitch in the first half, jinked into the box and got a shot away but Bond was equal to it down at his bottom left. Just two minutes later Kayal drove into the box before laying the ball off to Andone but the Romanian striker's attempt took a deflection off a West Brom defender and was easily claimed by Bond. Anthony Knockaert goes down in the box after pressure from Tyrone Mears and Wes Hoolahan. Just after half-hour, Kayal hit a 20-yard piledriver from outside that box that looked easy for Bond, but the West Brom 'keeper parried the ball out. It took a good clearance from the Baggies' Tosin Adarabioyo to prevent the onrushing Andone from finishing from close-range. Bissouma then hit a rasping 25-yard drive just moments later that beat Bond but dipped just over the crossbar. On the stroke of half-time, Bruno played a ball to Locadia down the right-wing and the Dutch wingman drove to the byline before cutting the ball back to Andone at the near-post but the Romanian's shot went wide from close range. Despite the Seagulls dominance on the ball, they couldn't covert their plethora of chances and the half ended goalless. Brighton's Israeali midfielder Beram Kayal in action against West Brom in the fourth round of the FA Cup. Ten minutes after the restart, West Brom's Jonathan Leko found himself on the edge of the box and twisted and turned before the Seagulls defence swarmed him. Leko eventually laid the ball into the path of Harper who unleashed a thunderbolt from 25-yards out but his shot went wide of the target. Two minutes later, Brighton's Dale Stephens had a long range shot of his own. Receiving the ball 30-yards away from goal, the Irishman released a howitzer that forced Bond into a great save to parry the ball onto the post. On 62 minutes, Montoya had to produce a great tackle to deny West Brom an easy opportunity to score. After the Seagulls were caught on the break, the hosts found themselves outnumbered at the back. Harper received the ball in the box, and only needed to roll a pass into Robson-Kanu for an easy finish, but Montoya timed his intervention to perfection to dispossess the young Baggies midfielder. The game began to become stretched with both sides leaving holes in the middle of the park, which lead to both teams becoming vulnerable to the counter. West Brom won themselves a free-kick out on the right hand side of the penalty area on 71 minutes. Wes Hoolahan's whipped cross went to the back-post where it was met by Adarabioyo but Button made a fine save to tip the ball onto the crossbar to keep the scores level. Five minutes later, young Seagulls substitute Viktor Gyokeres skipped past three Baggies defender before unleashing a low drive to the left which Bond could only palm out for a corner. The last quarter of the second half saw chances at a premium, with Brighton winning a succession of corners without producing anything clear-cut. As the full-time whistle blew the game ended goalless and the Seagulls were left to rue their lack of attacking thrust throughout the 90 minutes as a replay beckoned. Brighton & Hove Albion: Button, Bruno, Duffy, Burn, Montoya, Stephens (Propper 63), Kayal, Bissouma, Knockaert, Andone (Murray 83), Locadia (Gyokeres 72): Unused: Sanchez, Dunk, Gross, March. West Bromwich Albion: Bond, Mears, Adarabioyo, Bartley, Townsend, Field, Harper, Hoolahan (Tulloch 81), Leko (Holgate 89), Edwards, Robson-Kanu. Unused: Myhill, Fitzwater, Gibbs, Howkins, Gayle.